Page 1: Happy Holidays from us to you! Want to know our holiday hours they are in our newsletter. 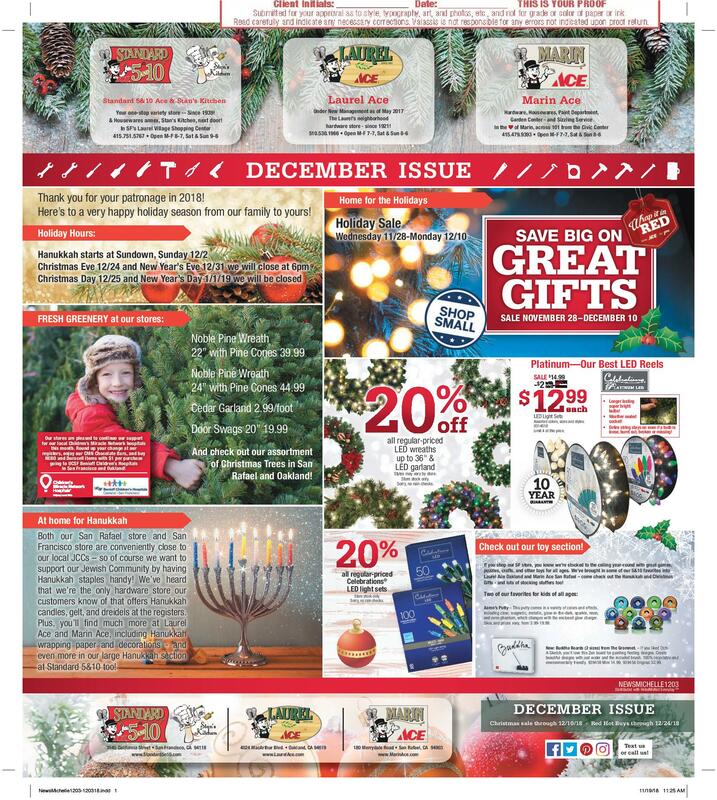 We have your Hanukkah needs and supplies from gelt to dreidels, menorahs, and candles, we even have wrapping paper. We have fresh greens at our San Francisco store and fresh Christmas trees at Marin Ace in San Rafael and Laurel Ace in Oakland. If you are looking for holiday or Christmas lights we have a great deal going on right now for all sorts of lengths of lights, and pre-lit wreaths. There is the special “Wrap it in Red” holiday sale going on until the 10th. And we have activated our ’round up’ function where instead of us handing you more coins to get lost in your pocket, you round up your purchase to a whole dollar amount and 100% of the donation you make goes to Children’s Miracle Network for UCSF Benioff in Oakland and San Francisco. Page 2: Gifts galore abound on this page. There is a great deal on Yeti tumblers and drink holders. A brand new Ace-exclusive Weber Grill (the Genesis II in indigo). 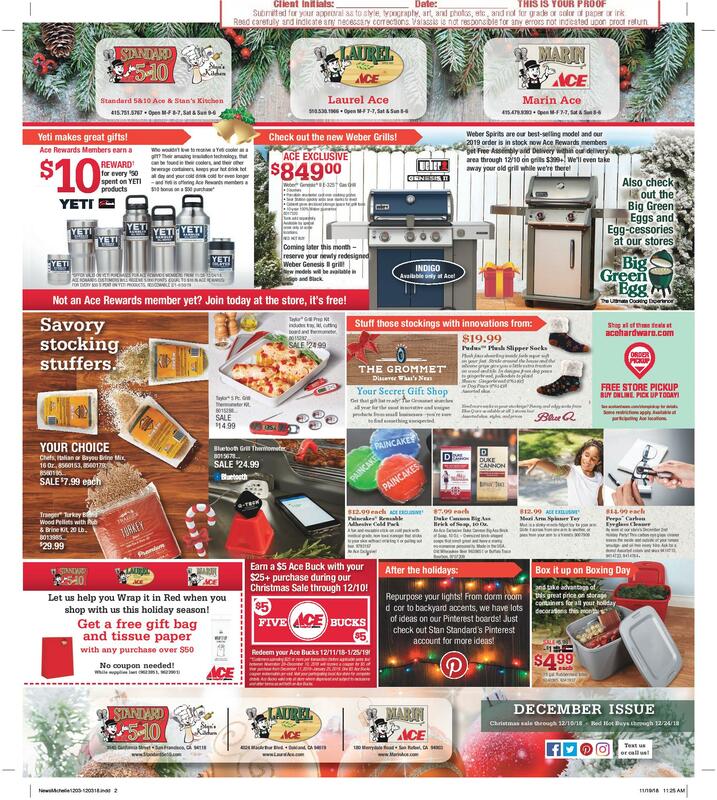 A great deal on a Weber Spirit, and all the stocking stuffers a grill and BBQ aficionado could want. We have the blue-tooth enabled iGrill thermometer, multi-thermometer grill packs, beginning BBQ sets with all the essentials to get grilling and various types of rubs and spices for the perfect outdoor event. For those less grill inclined we have the Grommett. Gifts from the Grommet are always unique and will be remembered here we highlight the PUDU slipper socks for coziness, the stick on pain packs to help your sore back after hanging Christmas lights, Duke Cannon soaps to get rid of over flowered showers, The Mozi arm spinner (think: slinky meets a hula-hoop for your arm), and Peeps carbon glasses cleaner to get you spectacles sparkling clean. We even help post-holiday with great deals on storage boxes and we give you some great ideas on how to repurpose all those holiday decorations the rest of the year via our Pinterest page! Oh, and there is a coupon for free gift wrap!